The Travers Stakes had been contested 146 previous times at the oldest racetrack in America, Saratoga Race Course. But a fairly unknown runner from the Bob Baffert barn would make this a memorable renewal of the Grade 1 Travers Stakes. I’m proud to say that I was wise enough to select Arrogate on this day, the last time anyone would get close to double digit odds on the amazing racehorse. Arrogate ran his final two furlongs in an unbelievable 23.84 and set a track record for 10 furlongs at Saratoga by hitting the teletimer in 1.59:36. 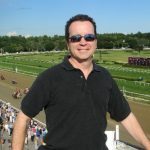 “The fastest Travers ever … and a new track record!” ~ bellowed track announcer Larry Columus. Left in Arrogate’s wake were talented runners Gun Runner, Creator, Exaggerator, American Freedom, and Destin.